Mumtaz is my dad and Ahmed is my nephew. 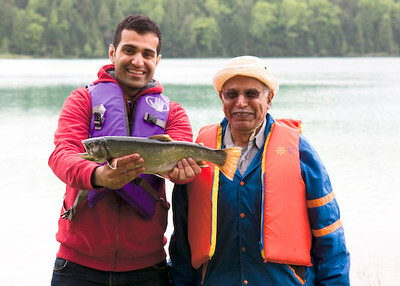 Every year for the past 34 years we all get together for the annual Rehman family spring fishing trip. The trip consists of great company, great food, and sometimes we even catch some fish. For you non-fisherfolk, that is a BIG brook trout! Heard you on CBC this morning (Apr 28) and was intrigued and checked the pics out. I knew that the first images of "Muslims" that came to mind (lots of beards, hi-jabs, not much smiling, etc) were simply silly, or worse, and I easily countered these images with lots of different evidence of Muslims from my own life. I try to be aware when I make that kind of mistake with anything but bothersome that they were still the first images. Perhaps some of your images will replace them. It was the final picture of the two fishermen and its description that prompted me to comment. That is so, so familiar. Could be any number of people from my own family, including me. And I knew it was a trout right away, although not a brook trout. Bet it was delicious!